Unknown people beat up a drunken Zambia police officer in Roan Township in Luanshya district yesterday and grabbed a gun from him. A source told ZANIS in Luanshya that the incident happened yesterday around 15: 00 hours when the police officer was heading back to Roan police station after attending duties at the magistrate court. He said the unsuspecting officer, who was in a drunken state, was attacked by a group of unidentified men who went away with an AK 47 riffle with an unknown number of ammunition. He further said the thieves were still on the run adding that the police officer was picked up by fellow police officers and was being held at Roan Police station. And Copperbelt Police Commanding Officer Charity Katanga confirmed the incident to ZANIS but could not give details of the incident. Ms. Katanga, who regretted the incident, said she was still awaiting information from Luanshya central police. These rogue policemen need to be removed from the Service. They are a danger to national security. The boss drinks at work, so? That is what happens! Khikikikiki…it must be Mr. Kudos’s father…Whatever Kudos was fed must have been in extremely excess dosage to the point, no part of his brain function or recalls anything. But hey, whats surprising is that in spite of his low IQ and the excess dosage he was drugged, he still recalls there is HH: and thats really awesome!!!!!!!! This is absolutely ridiculous. 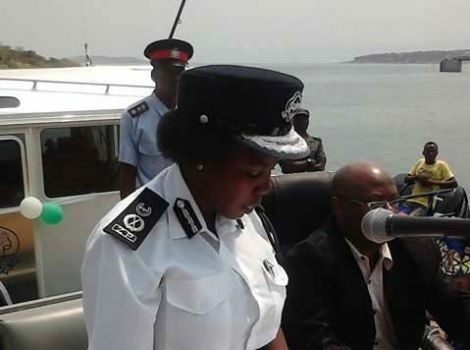 Only in Zambia do police officers report for work while drunk, or even drink while on duty. Fire this ***** and give him some jail time. Secondly, enforce the drinking laws regarding police officers. A drunk police officer is a danger not only to himself/herself, but to the general public as well. THIS IS ONE OF MY MAIN FEARS IN OUR COUNTRY- A CORRUPT AND UNDISCIPLINED POLICE FORCE FULL OF EASY-TO-BRIBE POLICE MEN AND WOMEN, CORRUPT CIVIL SERVICE AND A PHD SYNDROME. THESE OFFICE CAN EASILY SELL THE COUNTRY OVER A SACHET OF CHIBUKU AND A PACKET OF CIGARETTES (for those who have this bad habbit). IT IS COMMON IN THIS COUNTRY TO FIND A POLICEMAN DRUNK. THEY ARE NEVER DISCIPLINED BECAUSE THEIR BOSSES ALSO DO IT. WHEN THE MEDIA REPORTS A DRUNK SECURITY OFFICER THEY SHOULD ALSO BOTHER TO FOLLOW UP ON THE DISCIPLINE ACCORDED TO THEM AND REPORT BACK TO THE READERSHIP. BY THE WAY WHAT HAPPENED TO THE OTHER DRUNK POLICE CHAP WHO WAS FRAMED ON SOCIAL NETWORK? WAS HE DISCIPLINED? Khikikikiki…it must be Mr Kudos’s father…Whatever Kudos was fed must have been in extremely excess dosage to the point, no part of his brain function or recalls anything. But hey, whats surprising is that in spite of his low IQ and the excess dosage he was drugged, he still recalls there is HH: and thats really awesome!!!!!!!! I had an encounter with a drunken police officer on New’s day at some road block on my morning walk and the officer told me I could not go beyond the checkpoint on foot. He touted his gun but a fellow officer restrained him and told me to proceed. Drunken behavior is common among them and of truth, nothing gets done because in my home country no one gets held accountable for anything. Expecting any disciplining of censure of the officer may be as hard as expecting another finger to sprout between the index finger and the thumb of an adult. If there boss is a drunken master what can stop them be like him.This police officer is a criminal that was just a plan.he knows everything .he planned this with his fellow criminal so that they can go away with an AK 47 riffle.He was on duty how can he go for beer while on duty?This is how PF government is CHIMBWI no plan.Ask him properly he will tell where his criminals are and once they are found take everyone to jail together with him.Foolish police officer. This is truly langhable…this how standards have fallen in our country…complete lack of discliplne from top to bottom…utter disgrace ..they should have shot him in the leg as well with his own gun. If it were Mazhandu Bus Service or any other bus operator, they could have already revoked the operator’s license for drinking on duty. Now whose operating license are you going to revoke? Indiscipline has no boundary and this is a good lesson for you Police and RTSA to learn that the operator is mostly innocent except in few cases where they are liable. You should also stop your behaviour of grabbing driving licenses and car keys from suspected bad drivers because its not their licenses or vehicles which break the law but drivers themselves and only RTSA the issuing authority can suspend or cancel the license in cases of dangerous driving only, not illegally grabbing it. Unknown number of ammunition? My foot when you collect your firearm from the amour you also sign off for number of rounds in the magazine…so how can it be unknown? This behaviour stems from not so serious people lie Kambwili and a leant behaviour. If the big fat man in charge abuses office and does as he pleases and when ever he can, well so can employees (at least they think)! I hope they fire this chap and use him as an example. Imagine what those thieves will do with that gun. People’s lives are in danger all because of an ***** drinking while on duty. This calls for firing on the spot and a fine. Shame on them if they don’t do anything.